I went out early this morning to our favorite coffee & pastry shop and brought home Barry’s favorite raspberry oatbar and a steaming cup of coffee for him. He surprised me with a handmade card and a sampling of my favorite locally-made chocolates. No big drama, just little gestures that sweeten an otherwise fairly ordinary winter day. Noticing and appreciating the ordinary. Because when you think about it, the “ordinary” is actually very extra-ordinary. The chemistry of personalities that enriches our lives with love. The serendipity of events that bring us both bitter challenges and sweet resolve. My most recent sculpture, Winter’s Whimsy, is in many ways a meditation on the ordinary and about finding lightness, even in the heart of cold dark winter. If it’s snowing where you are today, catch a snowflake on your tongue. It will make you smile. If you feel you’d like to add a bit of winter whimsy to you collection, Winter’s Whimsy is available to order until April 15, 2014. Click for more photos, info and to order. 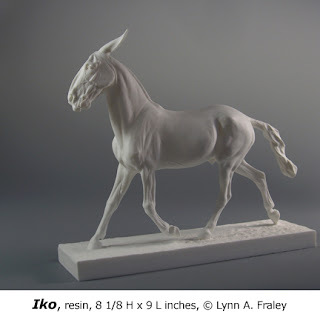 This entry was posted in a New Item for Sale, a New Resin, a New Sculpture on Feb. 14, 2014 by Lynn Fraley. He’s finally done — Peppy Poco ChaCha. As you might have noticed, it took much longer than I thought it would. When I started on this little diversion of a project, back in January, I thought this would be easily completed within a couple of months. Right. Sigh. Since then tale of the mane and tail has become my main obsession. Quite often, I have been disdainful of manes and tails as a sculptor. Especially manes. They only cover up all that gorgeous neck structure that I love so well. And, let’s face it, other artisans like to customize manes and tails to create a unique piece, so why not make it easy for them by not having a cascade of mane that will just be dremelled off anyway. (Is “dremel” officially a verb yet? If so I suppose I can properly use a past-tense version…) So for the past few years I’ve kept manes pretty sparse. But now I was faced with a dynamic sculpture demanding that a complete story about movement be told. Where did that movement begin? Where is it going? How fast? Beyond depicting the structure of bone and exertion of muscle and what visual element do you have to work with? Hair. Long silky hair. I think there’s a nice flow when all’s said and done. A note here about the tail. I started out being very swirly and curly, a highly dynamic sculpture in it’s own right. But that didn’t work with the overall design of the piece. Too busy, too eye-pokey for an area of the sculpture that is intended to depict a pivot point. It was more show than flow. In the end the idea of “Flow” won out. Peppy Poco ChaCha will be available for order starting tomorrow, December 12, 2012. Newsletter subscribers will receive an alert later tonight with more details. 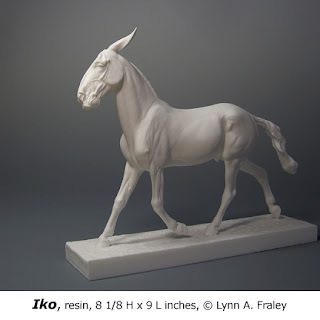 This entry was posted in a New Item for Sale, a New Resin, In-Process, Studio Tip on Dec. 11, 2012 by Lynn Fraley. You saw Indigo Beau way back on August 9, 2010, in this post. Since then he has been patiently waiting his turn in the queue for molding and casting — well, he’s a draft horse, of course he’s patient (even if I’m not)! If you think he looks familiar, you’re right. This is a mature version of Bram’ll Blue Boy, who was a rather gangly, goofy youngster released as a limited edition in 2008. Horses mature from their toes up. Foals are born with about 80% of their adult leg length, as I understand it. The last bones to reach full growth are the vertebrae. That’s why those adorable babies charm us with those long, long legs and compact little bodies. To create Indigo Beau I followed that growth pattern, lengthening and deepening Blue Boy’s torso, adding a fully developed cresty neck and of course a luxuriant full mane and tail. His face also became more wise and dignified as befits an older gentleman. You know I love drafters, and I admit to being smitten with Indigo Beau — I can’t wait to see all the beautiful colors and patterns that our community’s talented painters will clothe him in! The very first Indigo Beau was sold this past Saturday as a fundraiser for Idaho’s Treasure Valley Model Horse Club at their annual Spring Fling show — many thanks to Robin Irwin for winning that silent auction!! This Thursday, May 5th, you may order your own copy of this new drafter. More photos and sales information are available now at the Laf’n Bear website. 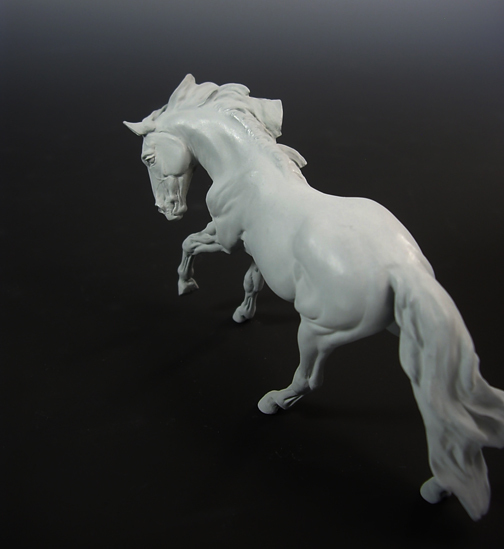 This entry was posted in a New Item for Sale, a New Resin, draft horse on May. 3, 2011 by Lynn Fraley. 01.20.11 Lights – Camera – Book! The instruction book that is. Yup, I’ve been in a camera rut, shooting with the same settings all the time, and not always getting the results you’d hope for. So on the advice of my friend Sarah Minkiewicz I dusted off the camera’s instructions. Wow, I’d forgotten quite a bit about the features of the cute little peashooter (a four-year-old Pentax Optio A30). A couple of obliging mules were rounded up for a much needed practice session. In a studio lighting workshop last year I learned that studio photographers often do not point a light directly at their subject. Yes, that’s counter-intuitive, but you get a softer lighting effect using the edge lighting from a parabolic reflector. Two separate lights give you a tremendous range of lighting effects and control. The beauty of a digital camera is that you can watch the way the light changes in real time on your camera’s screen. Often I’ll hold a light in my left hand, move it around the set area while watching the camera screen to find those lighting sweet spots. The tricky bit is focusing and shooting one-handed — do you remember the childhood party game, Twister? Yes, it feels just like that. Single source of light from left; ambient light from the right. Same single source of light from left; second source from right directly behind Iko, but pointed about a 90º angle away from him. Same single source of light from left; second source from right and brought to the front a bit and pointed at a greater angle away from Iko. Same single source of light from left; second source from front left, elevated. 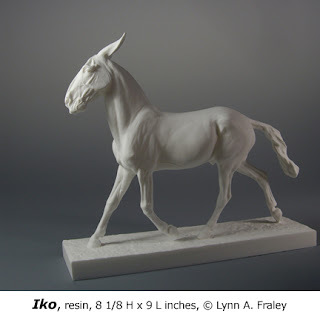 This entry was posted in a New Item for Sale, mule, Studio Tip on Jan. 20, 2011 by Lynn Fraley. 10.28.10 Monday will be Mule-day! A cavalcade of spunky mules is filling up our shelves! The mules are hollow cast on a rotational casting machine (above). When each frame is spinning simultaneously around its individual axis, it always puts me in mind of an MC Escher print. You know the one, with staircases going in all directions at once. Witching you a spooky fun Halloween in the meantime — boo! This entry was posted in a New Item for Sale, a New Resin, mule on Oct. 28, 2010 by Lynn Fraley. 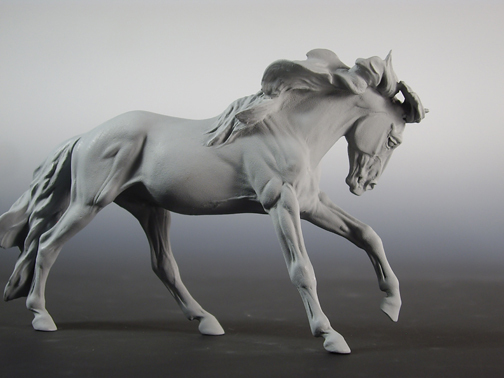 On Monday, October 4, collectors will have the opportunity to add a new resin to their collections — Rompadeux, a playfully cantering gelding. This piece is not breed-specific, you have any number of options for color choices. You don’t have to decide on just one color, collectors are welcome to order multiples. Rompadeux is a little gem of a sculpture; not even 3 inches tall, yet packed with the details and personality that make him come to life. He will only be produced for one year, or until 150 unpainted resins have been shipped to new homes, whichever comes first. The first batch will go up for sale on Monday at lafnbear.com with a handy shopping cart system. There will be no waiting for this first batch, they will ship immediately! UPDATE Monday October 4 — the first 25 have sold out, thanks everyone! You may order a future casting now, (click to go to the web page for more info). 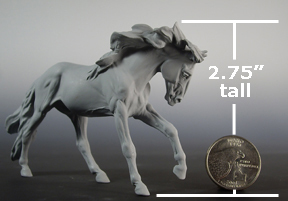 A nominal deposit is required at the time of your order, full payment is not due until your resin(s) is ready to ship. 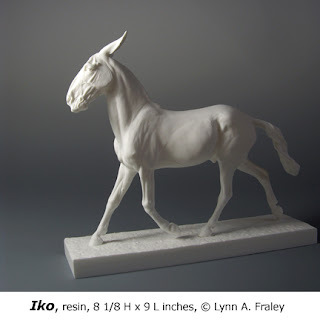 This entry was posted in a New Item for Sale, a New Resin on Sep. 30, 2010 by Lynn Fraley. 04.12.10 Attn China Collectors — New for You! Though he looks calm, cool and collected, this piece was a great challenge. In an earlier post I described how his color was built up in very thin layers. Enviado #4 was in and out of the kiln a dozen times, often for just the sheerest blush of color. The result you see is richly nuanced in both the bay areas and in the white of his tobiano pattern. This entry was posted in a New Item for Sale, Ceramic on Apr. 12, 2010 by Lynn Fraley. Fellow artists, this one’s for you. Several days ago I mentioned a new lighting set-up for photography. Here it is, a two-light kit bought locally at Idaho Camera in Boise. There are plenty of similar kits available online and perhaps your hometown photo center has a selection as well. Two weeks ago Idaho Camera hosted a studio lighting workshop at the Vista Ave store. The one-hour session was geared primarily towards portrait photographers, but the basic principals apply to product photography. Pros: Clean bright light that is color balanced for daylight; energy efficient; stops action. Cons: You can’t see in advance exactly the lighting effect that will be captured in pixels or on film; you really must use a photography light meter to be able to judge what settings your camera needs. Pros: What you see is what you get; bulbs are available that approximate daylight (look for the blue tinted 5400º Kelvin photography bulbs, 250 to 500 watts). Pros: What you see is what you get, bulbs are available that emulate daylight (look for “Photo Fluorescent” lamps, “daylight balanced”, 30 to 85 watts); these bulbs do not get as hot as incandescent bulbs thus are a bit safer and more pleasant to be around; they are also much more energy efficient than incandescent bulbs. Cons: Fluorescent bulbs take a few minutes to warm up to their brightest light; these bulbs are more expensive than incandescent bulbs (but should last longer). Pros: What you see is what you get, bulbs are available that approximate daylight; these bulbs give off consistent color over time, some lamp bases come with variable power controls to fine tune how much light is given off. Cons: More expensive than other systems; they can get a bit warm. Long story short, I chose to go with a two-light kit outfitted with continuous light, fluorescent bulbs. The Promaster two light studio reflector kit includes light stands, lamp bases and parabolic reflectors that accept a photographer’s umbrella to bounce and diffuse light. Do you see how the umbrella is mounted near the center of the reflector, just below the bulb? The stem of the umbrella is secured in a channel built into the lamp base. 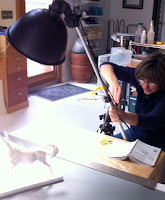 Do you see the stem protruding to the rear of the lamp in the lower left corner of the photo? Bouncing light into the umbrella provides a nice soft fill light. I also tried turning the umbrella around so that it was pointed towards the piece as if it was a soft box. The light quality is pretty nice, but there are really ugly reflections of the umbrella itself in the shiny surface of the gloss glaze. See below. Playing with the angle of the lights, the horse and the camera in relation to each other yielded the better, though not perfect, result seen below. Table top “cube” set-ups are used by many of my colleagues. They achieve stunning results. But with such fragile ceramic artwork, I simply prefer to have more open space to maneuver in than the interior of a tent. These highly reflective surfaces may force the issue however. 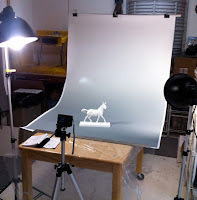 Another benefit is that this more open set-up is flexible enough to photograph flat work and sculpture that is larger in size. Shoot, I could start doing portrait photography with it too (but I doubt I will!). Final notes, the backdrop is a graduated “Flotone” brand vinyl backdrop from B & H in NYC. And any day now a diffuser sock, which fits over the reflector, will arrive. That should help to soften the harsh highlights of the main light, seen in the photo above as the bright glare on the hip of the horse. Alrighty, that brings you up to date with the latest experiments in studio lighting here. I hope the information is useful to you. If you have any tips to share, please do! We’re all learning together. P.S. Blog Triage docs and fellow students — this is not my Lesson Two post. Though it uses some principles from that lesson, it’s a follow-up post I promised readers on April 7th. The Lesson Two post will be done by Sunday night. Promise. This entry was posted in a New Item for Sale, Ceramic, Studio Tip on Apr. 11, 2010 by Lynn Fraley. 04.07.10 A Sneak Peek at New Work! Here he is, all bright and shiny! “Enviado”, a Paso stallion, number four in this series. You saw him in progress here and here. He’ll be available via auction soon! This auction will be scheduled to end on a weeknight evening — I know weekends are getting busier for people as the weather improves. In a quick comment yesterday on Laf’n Bear’s facebook page I mentioned that I was trying out a new studio lighting set-up. These photos are from that test session. Soon, these and several more will be added to our webpage. My goals for the new lights are fewer and softer shadows, accurate color without corrections and better balance throughout the image. Already in the test shots I have better overall illumination. I will keep tweeking the set-up until I can get good photos of the “white” areas of my pieces. I put “white” in quotes, because in my work these areas are *never* straight bright white. This entry was posted in a New Item for Sale, Ceramic on Apr. 7, 2010 by Lynn Fraley. Two little “Netzky” ponies are headed to Etsy on Sunday :-). The chestnut tobiano, #41 in the series, has lots of scritched mapping on her fuzzy coat and a really pretty face. The other is a minor CBCM with a more tightly tucked and turned head, very cute! A really nice toasty golden buckskin color to boot. Update 3.22.10 — Many thanks to true blue Etsy watchers! The ponies have new homes. This entry was posted in a New Item for Sale, Ceramic on Mar. 20, 2010 by Lynn Fraley.